Asset allocation is more art than science. There are no immutable laws to tell you what proportion of stocks and bonds should be in your portfolio. The best you can do is adopt rules of thumb. “Make your bond allocation equal to your age” is a popular one, as is “Don’t invest in equities if you will need the money within five years.” In the end, it comes down to a trade-off between risk and expected returns. (Bloomberg/Wiley, 2010). Swedroe, who writes the Wise Investing blog at CBS MoneyWatch, is one of my favourite financial authors because he always backs up his arguments with hard data and practical advice. 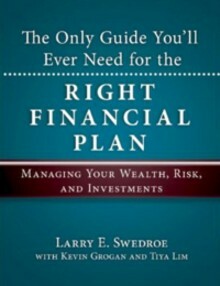 His new book is written for an American audience and most of the financial planning advice isn’t useful for Canadians. However, a large part of the book is devoted to asset allocation decisions, which should be based on “the ability, willingness and need to take risk.” Let’s break down these three factors. Swedroe says your ability to take risk depends on your investment horizon and the stability of your income (or human capital). If you’re 25 years from tapping your savings, or if you’re a senior public servant, you can keep a large portion of your portfolio in stocks. If you’re three years from retirement, or if you’re a commissioned salesperson, you should hold a far greater proportion of fixed income investments. How likely are you to panic when your portfolio loses value, as it inevitably will? Is a 25% drop going to give you ulcers? The willingness to take risk depends on your psychological makeup. Advisors give their clients risk-tolerance surveys to measure this willingness, but these are only worth so much. Only real-life experience — and we just had a litmus test in 2008–09 — will determine how big a loss you can truly tolerate. Finally, all investors should consider their need to take risk. If your financial plan suggests you’ll need a 7% annualized return for 20 years to retire comfortably, you’ll need a significant allocation to stocks. But if you’ve saved enough money to meet all of your financial goals, you might forgo all market risk. Swedroe tells the story of a couple in their 70s who had saved $13 million, only to lose $10 million by investing it all in tech stocks. The couple admitted that if their portfolio had doubled, it would have had no effect on their lifestyle or happiness. Why, then, did they put all that money at risk for no reason? Swedroe doesn’t match specific asset allocations to target rates of return, which is smart, since no one can predict what the markets will give us in the future. However, in a previous post, I included a table of returns for different stock-bond mixes since 1970. Vanguard also publishes historical returns for several portfolio mixes going all the way back to 1926. Just remember that these historical returns may be lower going forward. Burton and Malkiel suggest allocations in Elements of Investing that I think would be useful to readers here – you may want to post them. They are not as conservative as the “Make your bond allocation equal to your age” though they do provide a table of more aggressive allocations and one that is more conservative. Also, in true “set it and forget it” fashion, as someone in mid to late 30s, my rule of thumb has been to choose an allocation target and stick with it for defined set period of time. For my retirement portfolio that time is 5 years. So, on an annual basis I rebalance to this target until I am 40. At 40, I will revisit my allocation and bump up the fixed income portion and then revisit at 45, etc… For my RESP, I have chosen every 2 years as my defined set period of time. Without establishing this rule, I would fiddle too much with the allocation percentage. @Greg: Good idea — The Elements of Investing is available as a free download at http://lto.libredigital.com/?VanguardTheElementsofInvesting. See pages 108 and 109 for their suggested allocations. For the record, I think their suggestions are too aggressive, especially Ellis’s. He suggests 85% to 100% in stocks for people in their 40s, and up to 50% stocks beyond age 80. Ask some retirees how that would have worked out in 2008. Since you re-balance yearly I’m curious where you put your money for most of the year as you earn it. I had a similar plan, but with the top savings account at 2% (Ally Canada) and money market funds being lower than that, it makes me wonder. While I agree with the underlying principles, I find the allocation tables rather simplistic. Reality is much more nuanced. For example, someone may be one year from retirement (0% equity) and yet 20 years (100% equity) away from needing the 20th installment of yearly income. @RMCH – My secret is that my employer has an RRSP match program and I use the retirement program they offer to hold on to my savings until I can transfer them and purchase my ETFs. Money is drawn directly from my pay and is put into mutual funds in a workplace retirement account. Because the MERs of these mutual funds are reasonable, I have no problems investing in them (that portfolio is split almost evenly between canadian fixed, canadian equity, US equity and Intl equity). Once per year I move these investments into cash and transfer my portion of the RRSP contribution to a discount brokerage where I invest in ETFs. For the portion of my workplace plan that I am not allowed to transfer, I have set that to automatically rebalance to my target allocations. I only recently took control of my wife’s RRSP. We are using index mutual funds and dollar cost averaging. Not sure yet how I will rebalance that. I believe Couch Potato recently had an article on using TD Balanced Index Fund (TDB965) to hold monthly contributions. You should check it out. @Michael I think you can define risk in this case as the likelihood of a significant decrease in portfolio value. The longer the funds are in the market, the less downside risk. @Greg, you commented way back last November but how did you end up dividing up your assets between you and your spouse in RRSP and/or TFSA’s? We are thinking of holding 1 of each type of fund across all our accts (Cdn Equity, US Equity, Int’l, Equity, 2 types of Bonds) as opposed to duplicating the same funds in each of our RRSPs. How did you end up doing it? 2. Bonds – since you’ve got the coupon plus the underlying value and the underlying value is ultimately destined to be the face value the face value in theory over time has a 100% chance of losing value due to inflation, net dollars. However, because the coupon is paying returns over the whole life of the bond it mitigates a portion of that risk. In other words if you looked solely at the underlying value (what I’d call the “portofolio value” assuming you aren’t reinvesting the interest) you are guaranteed to lose net value. However, when you consider total net dollars you are better off. 3. Equities – tons of people focus in equities on the current value, when really the current value doesn’t matter, what matters is the total net dollars when you sell. Portfolio value could be done and you could be up (due to dividends) and yes over time in equities it’s true that the longer you hold on average (not true for any particular stock but for the asset class) the longer you hold the more likely you’ll increase in value. Of course, this might only be true if you’ve accounted for fees, taxes, etc. It’s important to recognize that when you look at these scenarios time risk is not measured the same across asset classes. The risk of holding cash increases with time. The risk to the underlying value of bonds increases with time but the risk overall stabilizes (because you’ve actually received the cashflow, which there was a certain margin of uncertainty on at purchase). The risk to equities decreases with time. The risk to permanent insurance increases slowly with time. Hi, I would like to know how to handle equity allocation with my risk profile. If I want to use the Complete Couch Potato but instead having 40% in fixed income, I just want 20% of fixed income, what should I do with the equity percentage? Should I just keep the same ratio as they are so I get something similar to this? Or do I have to split it another way than keeping the ratio for the equity part? @Sebastien: Target allocations are not an exact science, so I would just round off the numbers, e.g. 23% each to Canada, US and international, plus 11% real estate. Ok, so if I understand, real estate should not be accounted with the canadian equity when we divide equity in 3 equal parts for Canada, USA and international. Does small-cap equity must be included to the country equity before I divide by 3 or is it separate like real estate? @Sebastien: Don’t make the process too complicated. There is no magic formula: just pick a reasonable target and stick to it over the long run. i believe you have already written about bond etfs and their rate sensitivity. Just can’t find the article. do you know where I can find it? @Mark: You should ask a financial planner as every situation is different and what you’re asking is not a general question. Couch Potato investing is for long term investors. When you’re near retirement, you have to adapt your investment strategy to your lifestyle, actual value of your portfolio, risk you want to take, life insurance you want to buy, etc. That can be different for everybody and needs much more informations to do the math. General rule of thumbs, if you allow more allocation to equity, you should expect higher return on the long term and maybe that will help to reach your goal in time. Not sure if this is the right place to ask, but I have been thinking more and more about risk and and fixed income percentage. I am in my mid-30s and have 10% bonds (aggressive), but if I look at the model portfolios, the 10 and 20 year annualized returns are essentially identical for the 40%, 25%, and 10% fixed income strategies. Is this an anomaly and it just so happens we are at a moment where they are equal? Or should I take this as a sign that perhaps having more risk in my asset allocation may not yield higher returns in the long run? In my situation I am investing for both short and long term (essentially just have this as a sort of savings account outside emergency funds), but my question is more general: Is it worth the risk to have less fixed income? Where is the benefit? Martin: Having more equity should give you better results on the long run as they tend to deliver better returns. When the interest rates will go up, bonds will lose value and you should see a bigger difference between safe and risky portfolios. Oops, my apologies! I didn’t realize it had already been answered in detail. Thanks for the link, and I’ll be a bit better with the search function next time! Thanks for the guide, and the Q and A in the comments section has been just as useful!!! Is it a bad time to invest in most ETFs right now? Using the couch potato method, should I use this technique for my cash and RRSP account independently or combine the two? What I mean is if I should do a couch potato plan for each account? Or should I view them as a whole, with the bond portion of my CP plan in the RRSP account and the equity fund portions in my cash account?